The primary goal of this site is to offer current trail maps and info for the Sheltowe Trace. 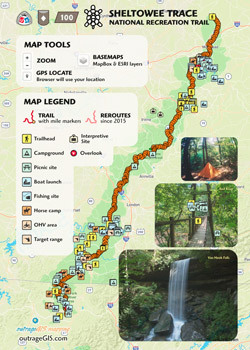 The website is a project by outrageGIS.com to help maintain a printed map for the trail. The most recent maps show the north and south Sheltowee Trace on two publications, which are available for purchase with lamination. We have been building a mobile version of the Trace to help locate your position on the trail and share information with other users. The current map will geolocate you with cell service and a GPS on your mobile device. Interested in reading thru hike trail logs? Our members have contributed a lot of awesome info to the forum that can help new trail users find a good hikes. It's archived and searchable. Visitors can also explore the history and growth of the Trace, both digitally and on the ground.